Crazy 8 is at it again! Once again, Crazy 8 has announced the beginning of an amazing sale that's been created for one reason, and one reason only.... Saving parents some money! 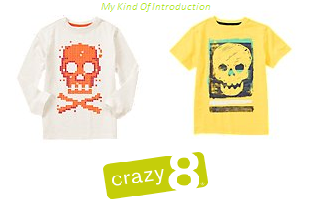 Don't miss out on the Buy One, Get One for $0.88 at Crazy 8! Their entire site is up for grabs, including markdowns! The opportunity for some mega savings is up for grabs and you'll surely regret it if you don't at least take a peek at all of their crazy cool kid fashions available for purchase. Snag these 2 Skull Tees for under $7! Swing on over to Crazy 8 and see how much you can save! 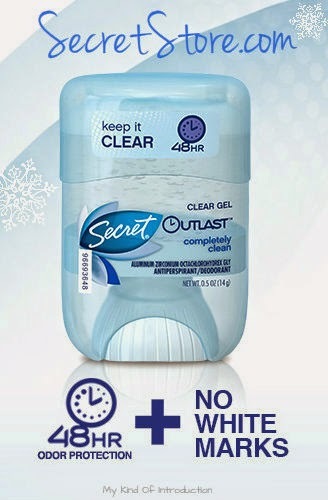 Get yourself a FREE Trail-Size of Secret Outlast Clear Gel Deodorant! Simply locate and click the button labeled: "Try Clear Gel"
at checkout to knock off the $0.99 shipping charge! Code has reached limit and is no longer available for use. Shipping and Handling is just $0.99! Get your FREE Sample at while supplies last! Offer available to the first 5,000 requests. Other samples available as well, shipping charges will apply since there are no codes for the other sample options. Thanks to Hunt4Freebies.com for Freebie notification! The December Mystery Box is Here!!!! The December Mystery Box is available NOW and is only $29.99! What's inside? Who knows?! It's a mystery, but this winter mystery box includes 3 cartridges and is worth over $100! Supplies are limited, so act fast before your too late! All mystery box purchases are final. Are your little one a book? Are you a parent of a spotlight craved child? "My Fairy Tale Books" has an amazing selection of #Holiday books as well as many other book topics, puzzles, placemats and even storybook cds! Of course we can't forget that everything comes PERSONALIZED!! Your child will rise above them all when they star in their very own book! You didn't think I was gonna leave you without reviling a few money saving Holiday Coupon Codes, did you? We all know that Black Friday is the busiest shopping day of the year? It's this Sunday, December 7, 2014. But how I see it, why wait until Sunday to start picking out your favorite holiday card design? Tiny Prints has an awesome deal right now that's only available for 24 hours ONLY! Receive 40% off your order as well as free shipping. No order size is too little or too big! 1. Visit Tiny Prints and choose your favorite from hundreds of holiday cards. 2. Personalize your card with pictures, text of your choice, etc. 3. At checkout, use the promo code: TPCARDS40FS to save 40% and get your free shipping!! It's that easy!! You'll have yourself a holiday card to be proud - designed by you! Valid from 12:00pm PT, Saturday 12/6, through 12:00pm PT, Sunday 12/7. Don't wait too long... 24 hours will be gone before you know it!! Full Disclosure for further details. Tis' the Season at Cricut: Save during their 12 Days of Christmas Sales + FREE Shipping! I couldn't of chosen a better time myself, then December, the coldest month of the year, to put the Ultimate Disney Frozen™ Cricut Explore® Machine Set on SALE for just $259! Through December 14th, Cricut is running the 12 Days of Christmas Sale, where each day there will be new and exciting item on SALE!!! Disclaimer: This post may contain affiliate links.﻿ View Full Disclosure for further details. Win 2 pairs of sunglasses every single year for the rest of your life!! Take DITTO's "style and fit" quiz , on any day between and Dec 11. This giveaway has a required minimum number of entries of 5,000 before it will end and a winner will be chosen. If your a lover of sunglasses - you could possibly win a jackpot of fashionable shade in the near future! *Complete the quiz and have a registered account to be eligible to win. Each pair of sunglasses can be up to $300. No matter how much you prepare yourself for parenthood, there are always those sudden surprises that none of those parenting books warned you about... You'll quickly realize that all of your hard work that was put toward preparing for your new baby, just got thrown out the window... And your baby ain't even a month old yet!! No more worries though... I may be able to give you a piece of mind in the form of a subscription box: Citrus Lane. What help can Citrus Lane give that you don't already have access too? How does - receiving a monthly subscription box, including between 4-5 of the best products that's carefully selected for your child's specific age and stage of development - sound? Join Citrus Lane today and save 40% off your first box + more! Each box is worth around $2I retail and shipping is always FREE. Holiday shopping is in full force and what a better time then this for Blurb to offer an EXTRA promotion to help you create the perfect gift books this season! Offers expire on December 9! Buy One, Gift One -- Help Put a Smile on a the Face of a Child in Need! Tis' the season to give. It's the time of year that many families take for granted... Please don't mis-quote me, I'm not meaning to be rude or disrespectful in any way. For every item purchased from one of Tea's Holiday Styles shops, Tea will donate a similar style of outfit to the Homeless Children’s Playtime Project. They strives to nurture healthy child development by empowering children living in temporary housing programs. The Buy One, Give One program will continue through Christmas. Check out the fabulous selections that's available for the Buy One Give One Program and help a precious child stay cozy and cute this Winter. No child should have to suffer if there are means available to help... Its as simple as purchasing an outfit for your child and Tea automatically selects a similar outfit for a child in need! It couldn't be any easier! Don't wait too long! Help our needy children today!! Buy One, Give One with Tea: shop girl holiday styles to give back! Buy One, Give One with Tea: shop boy holiday styles to give back! Buy One, Give One with Tea: shop baby girl holiday styles to give back! Buy One, Give One with Tea: shop baby boy holiday styles to give back! Add some love and personalization to your Christmas Tree this Holiday Season with custom photo ornaments. Any picture of your precious kiddos, furry friends, family vacation photos, even baby photos - perhaps a Baby's 1st Christmas photo?! Receive 60% Off Custom Photo Ornaments! Open to New and Existing Customers!! [Giveaway - Ends in 2 weeks] -- A Nailtastic Giveaway for the Mommies! This giveaway has set a minimum of 3,000 entries required before it will end.